Holiday house 13-15 people, Saxon Switzerland, anno 1818, from 2 nights! - Berghof Neustadt 13 Pers. 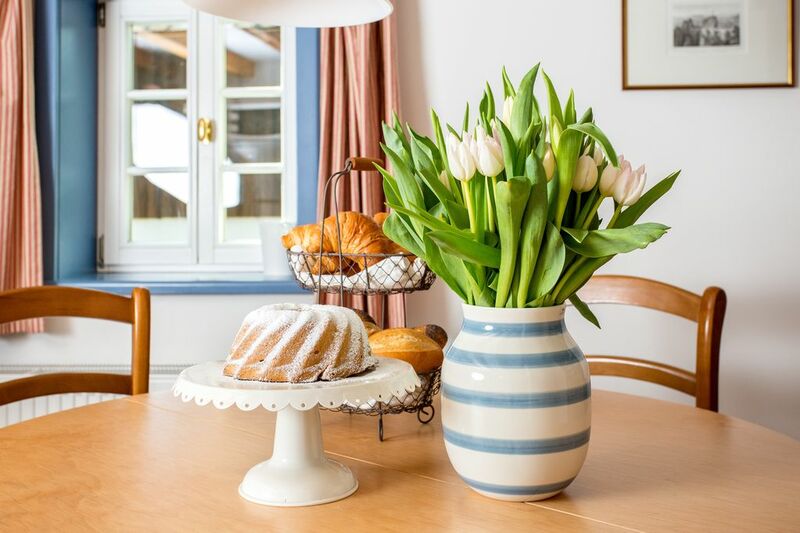 Our lovingly furnished holiday home Berghof Neustadt can be rented completely or as individual apartments. A nice setting for groups of friends with children or several families who want to spend a holiday together. With three kitchens, 3 dining tables for 4-8 people and a dining room for 14Pers., 4 bathrooms with 4 WCS, three bed corners, 3 cots, 4 high chairs, beautiful toys for children and board games. Here the days are very relaxing for several families , Altogether there are 3 double bedrooms, 3 bunk room for 2 persons and one single bed room, so space for 13 people. Additional sleeping space for up to 15 people on request. Perfect equipment. Saxon Switzerland / Oberlausitz: Romantic cottage in Main. Farm from 1818, 2011 together with the monument office carefully restored and completely new equipped, since 2012 as a child-friendly holiday home as a whole house (13-15persons) or divided as three individual apartments (4 + 4 + 5 pers.) Leased. White damask linen, cream towels and tea towels are included in the price, as well as the final cleaning and all utilities. In the off season are for the whole house also short stays of 2 nights (see Rates) possible. Urgemütlich, wunderhübsch and thoroughly with the charm of yesteryear, with beautiful wooden floors, beamed ceilings and authentic doors that admittedly somewhat lower headroom than modern buildings. A perfect house for several families shared vacations. 3 very large and superbly equipped kitchens, (incl. Toaster, kettle, espresso maker, coffee maker, dishwasher, microwave, tea pot, tea filter, washer, dryer). Three dining tables for 4-6 people, plus a nice dining room with a long table for 14 people and generously sized dishes and glasses, 3 comfortable couch corners with 3 small TVs and 3 stereos. Also outside there is a table for 14 people. Our house is very lovingly furnished and decorated. Here you feel immediately at home. 4 elegant, clean bathrooms with showers or bath and 4 toilets. 7 bedrooms with 3 double beds, three bunk beds and a single bed. All beds have new, high quality mattresses and new hypoallergenic bedding. In each apartment toys available for children, as well as board games for the whole family. Throughout the house there are three Highchairs and three cots. Our house is ideal for children of all ages. In fully enclosed garden a sandbox with toys, swings, Aufsitztraktoren, pumping wells, toboggan, 6 garden chairs and 3 umbrellas. In addition, seating for 14 people outdoors with beautiful wooden garden furniture and cushions, plus three charcoal grills, three umbrellas. Large cottage garden with flowers, herbs kitchen for our guests, fruit trees and meadow (4000 square meters), here are children allowed to run, climb trees, catch and play hide and seek, or petting sheep in the adjacent pasture. An oasis of calm, with the immediate vicinity of the Saxon Switzerland's biggest attractions (Bastion 20 km), also with wonderful excursions to Upper Lusatia. The Berghof Neustadt is attractive year for the whole family. In the summer is just life outside in the garden and magnificent, the kids splash in the bath shell that parents are under the apple tree. For hiking and trekking the Saxon Switzerland offers a wealth of attractions anyway. Whether hiking, steam out or a trip to Pillnitz and Dresden make, or visit with children impressive castle Stolpen, boring it is never here. To walk to the nearby fish farm to trout, pike or char for lunch buy, get fresh eggs at a neighbor, or in autumn in the nearby forest mushrooms. In winter, let the children tobogganing at the house, or go to Rugiswalde to ski or cross-country skiing. New Town is an exceptionally snowy area! After that always returns you back into the cozy cottage. Three kitchens with three washers, three living room with three TVs, three stereos. Three coffee corners for each 4, 4 and 5 persons. Three dining tables for 5-7 people each. Perfect to celebrate our new dining room for 14 people! In fine weather, all guests can sit together at a long table in the courtyard or on the terrace. Beautiful wooden toys for children. Generously measured crockery, cutlery and glasses. The price includes white Damstbettwäsche, towels, and tea towels. The wireless connection can be used free of charge. Wir haben den Berghof mit 6 Erwachsenen, 6 Jugendlichen und 1 Hund gemietet und waren alle restlos zufrieden. Die Räume sind sehr geschmackvoll und passend zum Haus gestaltet, der große Essraum bot genügend Platz für die gemeinsamen Mahlzeiten. Die Küche war hervorragend ausgestattet. Bei Fragen bekamen wir innerhalb kürzester Zeit eine Rückmeldung. Dass das Wetter im Oktober dann noch mitspielte, war das Tüpfelchen auf dem "I". Ein außergewöhnlich schönes Haus, das wir für unseren Familienulaub mit mehreren Generationen wirklich toll nutzen konnten. Sehr schön eingerichtet, sehr gut ausgestattet, mit viel Komfort. Der Garten und das Haus sind ein Traum! Der Berghof ist super eingerichtet und ausgestattet: niemals gab es Engpass beim Geschirr, die Kinder waren begeistert davon, im Haus Spielsachen vorzufinden! Das Anwesen mit Haus und Garten darum hat uns sofort ein Gefühl von Zuhause vermittelt. Tolle Umgebung mit Natur- und Stadterlebnis. Wir hatten eine sehr schöne Woche im Ferienhaus (5 Erwachsene, 3 Kinder). Es war mit Abstand das am besten ausgestattete Ferienhaus, das wir bisher gebucht hatten – niemals gab es Engpass beim Geschirr, die Kinder waren begeistert davon, im Haus Spielsachen vorzufinden! Das Anwesen mit Haus und Garten darum hat uns sofort ein Gefühl von Zuhause vermittelt. Wir, 4 Familien mit Kindern im Alter zwischen 1 und 8 Jahren, haben eine Woche super erholsamen Urlaub in Neustadt verbracht. Die Ferienwohnungen sind super ausgestattet, gemütlich eingerichtet. Der Gemeinschaftsraum ist sehr schön für gemeinsame Mahlzeiten und Spieleabende. Der Garten und der Hof war sehr einladend für die Kinder zum spielen und toben und die vorhandenen Spielgeräte wurden ausgiebig genutzt. Die Lage der FeWo ist sehr schön, die Ausflugsziele von hier aus sehr gut zu erreichen. Wir waren rund herum zufrieden und können dieses Ferienhaus nur weiter empfehlen. Neustadt is a traditional town on the border between Saxon Switzerland and Lusatia and Bohemia (the Czech border is only 3 km away). The Neustadt, located at an altitude of 400 m, is surrounded by green hills. The place offers all shopping possibilities. Several good restaurants also offer the discerning guest the opportunity to go out. The Berghof is about 80 m above Neustadt, at the Götzinger height on the roads to Hohnstein. The mountain is crowned by a traditional tourist restaurant, to which you can go on foot in the evening and enjoy a beer or a quarter of Saxon wine with a wonderful view from the terrace. In winter, there is a special attraction here - a toboggan run down to the valley. Our house is located in a small quiet historic settlement of 1820, surrounded by old shingle-clad farmhouses. Village atmosphere with the advantage of urban shopping and infrastructure. In Rugiswalde, about 5 km away, there is also a ski slope lit up at night with a modern lift. From here are also cross-country ski trails. The farm is off the beaten track, absolute peace is guaranteed. Not far away, not 200m m, start the meadows and forests, accompanied by a small stream, where children can play wonderfully. Immediately on the doorstep you can start wonderful walks, such as the Schluckenauer Zipfel to the Czech Republic, or a mountain hike to Ungerberg. To the Ungerberg-Rugiswalde with historic lookout tower and panoramic view of the neighboring mountain ranges of Lusatia, the Bohemian and Saxon Switzerland and the Ore Mountains. Worthwhile trips to Hohnstein in the Saxon Switzerland National Park, with wonderful hiking opportunities. Worth seeing and not far is the castle Stolpen, worthwhile is also a trip to the upper lock after Hinterhermsdorf in the wildly romantic Kirnitzsch gorge. Even the way past the Amselsee by boat is beautiful. The hike to the lock to Hiterhermsdorf is very relaxing. 15 km it is one of the famous destinations in the Saxon Switzerland National Park with the famous pinnacles and breathtaking views (Bastei 20 km). Also recommended is a trip to the Prebischtor in Bohemian Switzerland. Admirable is a trip with the Saxon Damfschiffahrt, the oldest paddle steamer fleet in the world, as well as a tour with the more than 100 years old Kirnitzschtalbahn from Bad Schandau to the Lichtenhain waterfall. From here, there are the most beautiful hiking opportunities in the back Saxon Switzerland. In no case may you miss a performance in Europe's probably most beautiful natural theater, the Felsenbühne Rathen. In view of the magical backdrop of the Basteimassiv, every performance from opera to drama becomes a special experience. Dresden with its sights is 30 km away, Prague about 140 km. Pirna and Bautzen are close. Worth seeing are Görlitz, Radebeul, Moritzburg, the mountain Oybin with its romantic castle and monastery complex, or the gingerbread town Pulsnitz. Alle Preise gelten für 13 Personen incl. Endreinigung, Verbrauchskosten, Bettwäsche und Handtüchern. Kurzbuchungen unter einer Woche sind nur für das ganze Haus und außerhalb der Schulferien möglich.